Our 2017 Guatemala calendar is offered in several sizes for your wall and even allows customization to make it the perfect gift. Find 12 months of unique inspirational photos of ruins, lakes, volcanoes, foliage and people. From the extraordinary ruins of Tikal to the volcanoes towering over lakes to the indigenous people hustling about the gorgeous Guatemalan markets, what is there not to like? 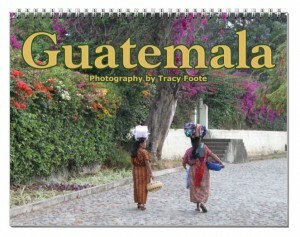 Escape to Guatemala each month as you turn pages revealing a unique culture and land of adventure. Guatemala is often referred to as the jewel of Latin America. Tracy Foote grew up in New York City but spent her childhood summers at camp in the Adirondack Mountains in upstate New York. There she developed a fondness of nature, the outdoors, and mountain climbing. Her love of South America began in high school Spanish class and grew throughout college where she minored in Latin America Area studies. Today she shares her passion of Guatemala by creating the perfect gift with her photographs in the hopes that everyone will have the inspiration and opportunity to visit.